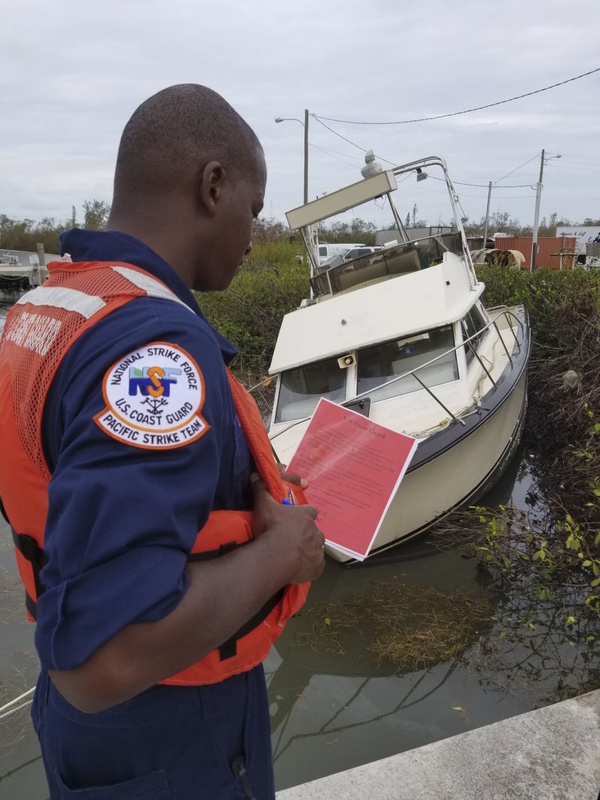 [Episcopal News Service] When your only home is a boat, chances are good you’re in trouble during a hurricane. Before Hurricane Irma’s September wrath, Christle Tallant, a single mother with two jobs, moored her 40-foot 1987 trawler in Boot Key Harbor in the city of Marathon in the middle of the Florida Keys. She and two of her three daughters fled their boat home to seek safety at a hotel in Orlando. When she returned, her home was smashed up against other boats in the marina canal with large holes and missing windows starboard, and small holes on the port side with deep gouges near the water line. 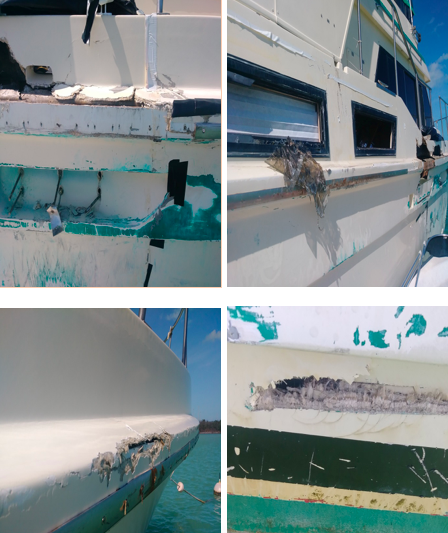 The bow’s walkway was damaged, along with the stanchions and anchor roller, and the stern suffered damaged fiberglass, swim platform and trim tabs. Tallant has done some repairs herself, but she can’t do it all. “I’ve been reading on how to repair everything … I’m like, how do I even do this? I don’t know. It’s a little overwhelming,” Tallant told Episcopal News Service more than five months later. They’re still living on the boat. 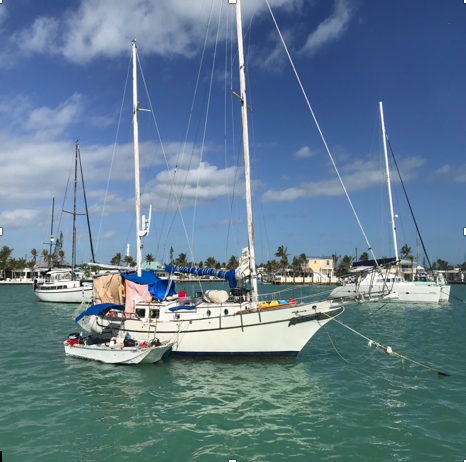 Geoffrey Smith, chief operating officer of the Episcopal Church, heard the harrowing stories from a few Keys boat residents like Tallant when he accompanied Presiding Bishop Michael Curry on a post-hurricane pastoral visit to the islands in January. A former deacon in Maine and a lifelong boating enthusiast, Smith thought he could use his connections in the northern boating industry and church friends to help. He also used to work as a risk manager for Brunswick Corp., a large boat builder. “I thought this might be a way I could help,” Smith said. So, Smith wrote an email to the Rt. Rev. Stephen Lane, bishop of the Diocese of Maine, and Lane passed the word to parishioners, clergy and people in the boating industry around Maine. “It’s just a good example of how sometimes, we can serve as connective tissue. We have boat builders in our community, and some of our parishioners are boat builders,” Lane told ENS. The Rev. Nina Pooley, rector of St. Bartholomew’s Episcopal Church in Yarmouth, Maine, took the lead. 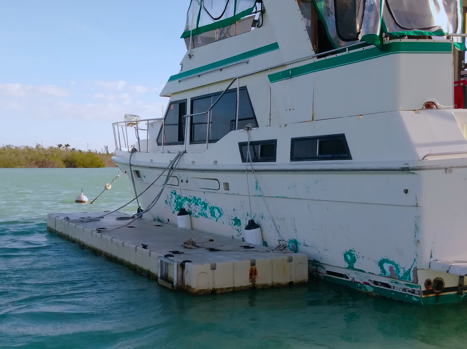 Based on the responses from the community, she organized the volunteers into two groups: boating experts who can travel to the Keys to help with repairs and people with connections to large companies in the boating industry. “Geof was right. We have these ties, the capacity and the will,” Pooley told ENS. The liveaboard boating aid project is in early stages, and there is so much work to be done. The Florida Fish and Wildlife Commission had removed more than 1,100 unsafe vessels from the Florida Keys waterways by Oct. 31. 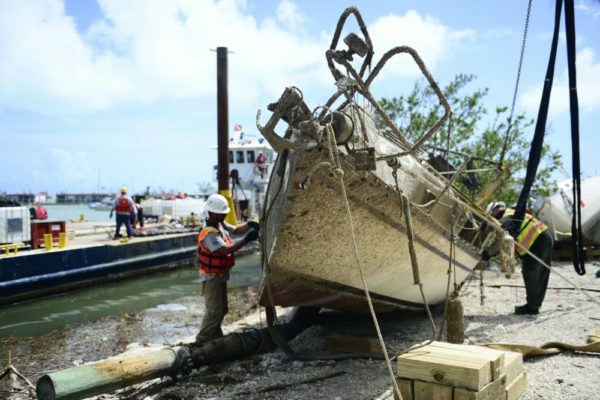 The Weather Channel reported that by late November, the U.S. Coast Guard recovered nearly 1,500 boats that were damaged or destroyed. That work continues, as there are so many more damaged boats than these numbers suggest. Smith needed a way to narrow down the project to some of the most desperate cases. They were the working-class families whose boats are their only homes — boats that weren’t destroyed but damaged to the point of needing expert help with repairs. Smith turned to the Rev. Debra Maconaughey, rector of St. Columba Episcopal Church in Marathon, which has taken a lead in local hurricane relief and recovery. “I asked Debra, ‘We can’t address all the thousands of boats damaged, but what can we do?’ She identified 16 boats, and we’re working to find help for those,” Smith said. Maconaughey talked with the harbor master at Boot Key Harbor City Marina, who had his assistant make rounds and identify those 16 liveaboard boaters, compiling their stories and boat photos so that those who want to help in Maine will know what’s needed. “We already had money set aside to help with boats, but this was a way to partner with people to do way more than we could alone. This is exciting. We’re ready. It’s an unusual project but it’s great project. And it’s needed,” Maconaughey said. Mike Funkhauser and Antoinette Smith have a 3-month-old girl named Bay and live aboard a 43-foot 1977 Formosa. At the last minute, a then very pregnant Smith, Funkhauser and five birds evacuated in a church van as Irma barreled toward them. Funkhauser insists their boat isn’t bad at all compared to the wreckage they witnessed when they returned home after the storm. But there are serious issues. Funkhauser, who repairs boats for a living, is encountering work beyond his expertise, he said. He was able to fix their main mast, but the wooden mizzenmast has two cracks and is a few inches from their electrical system, which powers everything in their home. As time goes on, he keeps finding more problems. Pooley said that while New England boaters have a reputation for being affluent, many of those in Maine’s boating community are working-class boating people, like the many year-round people in the Keys, just with a different climate. They understand, and they want to help. And, as the families in the Keys continue in their long-term recovery, they say they are looking forward to that help.